Comes with FULL Master Resell Rights, and two Mystery BONUSES! 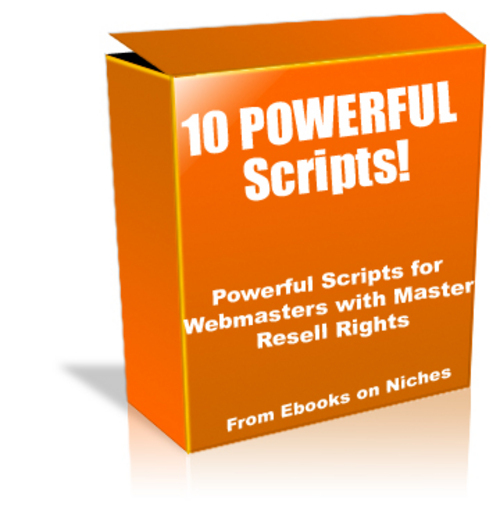 * 2 Auction Scripts: The First Is The Popular PHP Auction! Very nice auction website script and easy to install and operate. Lots of Premium Features! The Second Is the Popular CGI "Every Auction" Auction Script! Start your own auction website! * Awesome Template Engine For PHP: Awesome Template Engine is a PHP script used to create PHP templates! This revolutionary script makes the task a breeze! * PHP Web Ring Script: Create a webring with this fantastic script! This script does it all! Super easy to setup and install. Makes staying in contact with your webring members too easy! * Affiliate Program Script: This PHP-MYSQL based affiliate program script makes starting an affiliate program child's play! Easy to install and maintain. VERY secure. Excellent commission tracking. An affiliate program is the #1 way to grow your business online...hands down! * PHP Links Exchange Website Script: A PHP script that allows your visitors to sign up for an account, and then add their link to your website! Easy maintenance and automatically rids your site of dead links. Approve and delete links right from your browser! Search engines love linking. It's a win-win script for all! * FTP Program Script: A GREAT PHP script! This script allows you to set-up and operate your own FTP server. Let your guests use it, or keep it for yourself. Big features without the big price tag! * PHP Authentication Script: Easily secure those restricted areas of your website! Easy and fast to install. Powerful protection! * 2 Great PHP Toplists Scripts: Operate your own "toplist website. Loads of features. Sell advertising, create rules to follow, allow banners, anti- cheating measures and more! Easy to match the look and feel of your website. This product comes with MASTER RESELL RIGHTS! To make the deal even sweeter for you, we are even including two announced bonuses with it! Only those who purchase this product from us would be able to get the bonuses at NO cost!